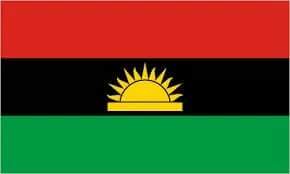 The flag of the Republic of Biafra consists of a horizontal tricolour of red, black, and green, charged with a golden rising sun over a golden bar. Red represents the blood of those massacred in northern Nigeria and in the consequent Nigeria-Biafra war. Black is for mourning them and in remembrance. Green is for prosperity and the half of a yellow/golden sun stands for a glorious future of Biafra. The sun has eleven rays, representing the eleven provinces of Biafra .